I am not sure if this forum is proper for this question. If not please forgive me. I have 2000 year Blazer with airbag. I need to do some modifications with my electrical system - change brake lights and tail turn lights connections. Need I remove steering column covers and steering wheel to work with cables? Any idea? Maybe I can remove only instrument cluster to get cables but how to identify what is brake light switch cable and what is from turn signal flasher cable? It is not so easy. Now I have every taillight consisted of three bulbs: two of them are taillight/turn/stop and one is white lighting in time of backing up the car. 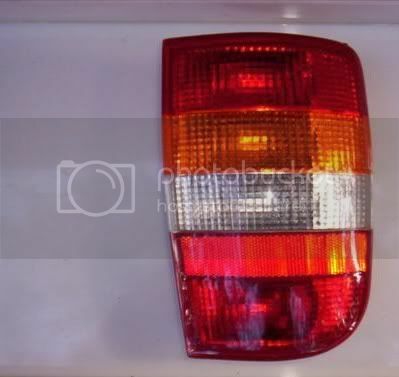 Now I have to install European lights with separate taillight, amber turn light, separate stop light, tail fog lamp and white one - see the picture. So I have add some wires and change existing. Let me see what I can find for wiring schematics to see if any of them make mention of this type of configuration. 2) removing panels in car to put new wire. What is the best way to put it? I have two days to do it. And I hope airbag deactivation and activation procedure will no cause any problem to me. Another (last one) question is how to remove panels to put new cables and not to destroy panels? Here is text for removal of Steering Column Trim. If you are performing service on or near the SIR components or the SIR wiring, disable the SIR system. Refer to Disabling the SIR System in SIR. Disable the SIR system. Refer to Disabling the SIR System in SIR. Remove the steering wheel. Refer to Steering Wheel Replacement . Remove the tilt steering column lever (1) from steering column (2). Remove the screws that retain the lower steering column trim cover to the steering column. Remove the lower steering column trim cover. Tilt the trim cover down and slide it back in order to disengage the locking tabs. Remove the screws that retain the upper steering column trim cover to the steering column. Remove the ignition lock cylinder. Refer to Ignition Lock Cylinder Replacement - On Vehicle . Remove the upper steering column trim cover. [ul][*] Ensure the turn signal lever on the multifunction switch is in the neutral position or the off position. [*]Remove the knee bolster. Refer to Knee Bolster Replacement in Instrument Panel, Gauges and Console. [*]Loosen the steering column bracket nuts. [*]Remove the steering column upper and lower trim covers. Refer to Steering Column Trim Cover Replacement - On Vehicle . [*]Remove the 2 wire harness straps from the steering column wire harness. [*]Remove the connector position assurance (CPA) retainer from the auto trans shift lock control. [*]Disconnect the steering column bulkhead connector from the vehicle wire harness. [*]Disconnect the gray and the black connectors of the switch from the column bulkhead connector. [*]Remove the multifunction switch to the steering column mounting screws. [*]Remove the multifunction turn signal/hazard switch. Install the multifunction turn signal/hazard switch. Use a small blade screwdriver in order to compress the electrical contact. Move the multifunction switch into the position. Ensure the electrical contact rests on the canceling cam assembly. Use the correct fastener in the correct location. Replacement fasteners must be the correct part number for that application. Fasteners requiring replacement or fasteners requiring the use of thread locking compound or sealant are identified in the service procedure. Do not use paints, lubricants, or corrosion inhibitors on fasteners or fastener joint surfaces unless specified. These coatings affect fastener torque and joint clamping force and may damage the fastener. Use the correct tightening sequence and specifications when installing fasteners in order to avoid damage to parts and systems. [ul][*] Install the multifunction switch to steering column mounting screws. Tighten the multifunction switch mounting screws to 6 NÂ·m (53 lb in). [*]Install the connectors of the switch to the column bulkhead connector. [*]Install the steering column bulkhead connector to the vehicle wire harness. [*]Install the connector and the connector position assurance (CPA) retainer to the auto trans shift lock control. [*]Install the 2 wire straps on the steering column wire harness. [*]Install the steering column upper and lower trim covers. Refer to Steering Column Trim Cover Replacement - On Vehicle . [*]Install the steering column bracket nuts. Tighten[*]Tighten the steering column bracket nuts to 30 NÂ·m (22 lb ft). Install the knee bolster. Refer to Knee Bolster Replacement in Instrument Panel, Gauges and Console. Ensure the lever is in the center or the OFF position. Enable the SIR System. Refer to Enabling the SIR System in SIR.